At the weekend I participated in Dewey's 24 hour readathon which, in the UK, took place from 1pm on Saturday until 1pm on Sunday. 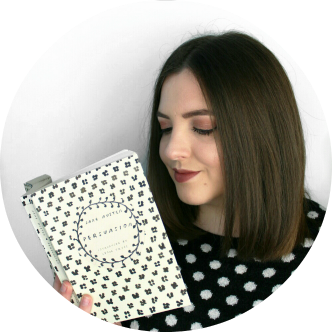 I did post an update on how I was doing with the readathon on Saturday night, which you can read here in case you missed it, but I thought I'd do a full wrap up post to tell you how much I read and my experience of the readathon in an hourly breakdown. In anticipation of this post I made sure to write hourly notes on my progress during the readathon. which looking back on, become quite delirious at around the 1am mark in the early hours of Sunday. But I'll do the best I can with them haha! Hour 1: I had my book, my snacks and an exceedingly cosy blanket ready so I started the readathon right on 1pm. I started with my first book Crown of Midnight and managed to get 55 pages read despite some Twitter distractions caused by readathon excitement. Hour 2: Lunch break time! I stupidly forgot to have lunch before the readathon started and staying energised seemed important for my reading stamina, so a break was in order. Hour 3: Back to reading, I got 49 pages read this how with minimal distractions. Progress! Hour 4: I got distracted by Twitter and had fun cheering other readers on with their reading instead of getting mine done. No reading happened this hour, whoops! Hour 5: Having read only 104 pages of my book I was already feeling a little slumpy so decided to get some fresh, blustery October air and take my dogs for a walk before continuing. This did the trick and I read 10 pages on my return. Hour 6: I settled down properly with my book again and read 48 pages this hour with not much distraction. I was on to page 162 of Crown of Midnight and absolutely LOVING it. Hour 7: I read 21 pages this hour and took a break to eat dinner with my parents. Hour 8: I was absolutely dying to get back to Crown of Midnight and got 23 pages further before hitting a major feels point in the novel. I proceeded to cry (I NEVER cry at books, this is a big deal) and had to head to Twitter to find someone to fangirl with. Hour 9: I managed to drag myself away from Twitter and get back into the book and read a whopping 71 pages this hour. Crown of Midnight started getting super intense and I managed to avoid all distractions. Hour 10: No reading happened this hour, I decided it was about time to write my update post before everyone who might read it fell asleep. Also some major snacking happened this hour. Hour 11: While my parents headed to bed I decided to settle myself in to a night of reading by running a bath and diving further into Crown of Midnight. I read 71 pages this hour which took me to page 348 of the novel with the end in sight. Hour 12: After my bath I did actually plan to get ready for bed and get straight back to reading but I'm not exactly sure what happened. My notes are kind of blank for this hour, I think I was just in a pit of feelings about Crown of Midnight and distracted myself with some YouTube videos. Hour 13: I think some reading happened this hour but my notes aren't exactly clear how much further I got, it was 1am and I was starting to get a bit crazy. Hour 14: I finally finished book one of the readathon! Crown of Midnight was incredible and intense and I loved it so SO much. Hour 15 through Hour 22: At about 3am, with 418 pages read, I decided to finally call it a day and get some sleep. I woke up just before 11 and I was so ridiculously tired that all I could do was lounge around in bed, no reading happened. 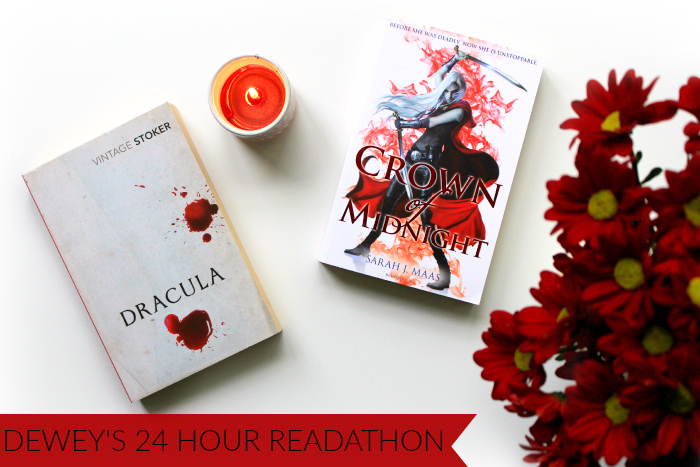 Hour 23: After I'd forced myself to wake up a bit, I realised that the readathon was nearly over, so at the end of hour 23 I decided to pick up my second book, Dracula by Bram Stoker, and read four pages. Hour 24: I only managed to read 11 pages in the final hour because I was just too sleepy and food was calling my name. I finished up the readathon having read a grand total of 433 pages! 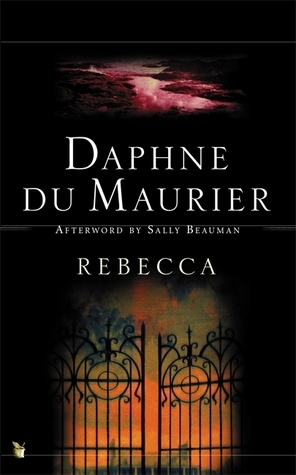 I'm really happy with how I did in the readathon because for most of October I've been in a pretty hideous reading slump, I've barely read anything and I was getting a bit worried that Dewey's would just be more of the same for me. I think that this readathon was just the thing I needed to get me out of my slump because it reminded me how much I enjoy reading and got me excited about picking up books again. Reading 433 pages in 24 hours is a lot for me, especially with how this month has been going, so I'm really pleased and proud of how I did! That's amazing, well done! I hope you loved The Rest of Us Just Live Here - it was one of my favourite books of the summer! It was a pretty great day, if a little intense! Crown of Midnight was brilliant, such a journey! I was quite emotionally exhausted by the end of it!